It’s not always necessary to replace your computer when technology moves on. 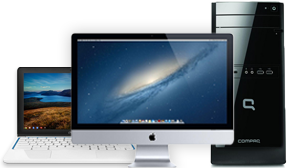 We provide a number of upgrade services to improve the speed and performance of your PC or Mac computer - from upgrading your operating system to installing a home network, new hardware or software. We’ll install your new piece of hardware; anything from memory and graphics cards to a printer or a broadband dongle. Anything more complex, like a motherboard or CPU, we’ll send it to our specialist lab. We’ll guide you over the phone or come to your home to help your set up a new network - or resolve any issues if it’s not working. Our advanced service includes securely setting up and configuring your network for up to five devices, such as your tablet, Smart TV and computer.